From Patricia Lockwood—a writer acclaimed for her wildly original voice—a vivid, heartbreakingly funny memoir about balancing identity with family and tradition. Father Greg Lockwood is unlike any Catholic priest you have ever met—a man who lounges in boxer shorts, loves action movies, and whose constant jamming on the guitar reverberates “like a whole band dying in a plane crash in 1972.” His daughter is an irreverent poet who long ago left the Church’s country. When an unexpected crisis leads her and her husband to move back into her parents’ rectory, their two worlds collide. 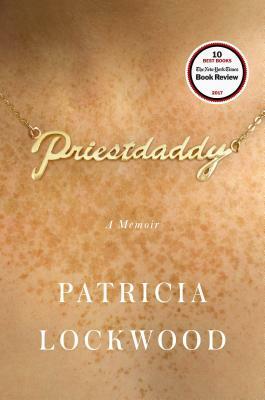 In Priestdaddy, Lockwood interweaves emblematic moments from her childhood and adolescence—from an ill-fated family hunting trip and an abortion clinic sit-in where her father was arrested to her involvement in a cultlike Catholic youth group—with scenes that chronicle the eight-month adventure she and her husband had in her parents’ household after a decade of living on their own. Lockwood details her education of a seminarian who is also living at the rectory, tries to explain Catholicism to her husband, who is mystified by its bloodthirstiness and arcane laws, and encounters a mysterious substance on a hotel bed with her mother. Lockwood pivots from the raunchy to the sublime, from the comic to the deeply serious, exploring issues of belief, belonging, and personhood. Priestdaddy is an entertaining, unforgettable portrait of a deeply odd religious upbringing, and how one balances a hard-won identity with the weight of family and tradition. Patricia Lockwood was born in Fort Wayne, Indiana, and raised in all the worst cities of the Midwest. She is the author of two poetry collections, Balloon Pop Outlaw Black and Motherland Fatherland Homelandsexuals, a New York Times Notable Book. Her writing has appeared in The New York Times, The New Yorker, The New Republic, Slate, and the London Review of Books. Lockwood lives in Lawrence, Kansas. “Lockwood’s humor can shape-shift into something else entirely, something quite moving. . . Priestdaddy is a book necessary for 2017—a meditation on living in the house of an unabashed patriarch, of asserting one’s humanity and continuing to take up space."